Originally Prince Rastko Nemanjic, he was the first Patriarch of Serbia (1219-1233) and is an important Saint in the Serbian Orthodox Church. In his youth (around 1192) St. Sava escaped from home to join the Orthodox monastic colony on Mount Athos and was given the name Sava. He first traveled to a Russian monastery and then moved to a Greek monastery, Vatoped. At the end of 1197 his father, King Stefan Nemanja, joined him. In 1198 the former prince and king restored the abandoned monastery Hilandar, which was at that time the center of Serbian Christian monastic life. St. Sava's father took the monastic vows under the name Simeon, and died in Hilandar on February 13, 1200. He is also canonized, as Saint Simeon. After his father's death, Sava retreated to an ascetic monastery in Kareya which he built himself in 1199. He also wrote the Kareya typicon both for Hilandar and for the monastery of ascetism. St. Sava managed to persuade the Patriarch of the Greek/Byzantine Orthodox Church to elevate him to the position of the first Serbian archbishop, thereby establishing the independence of the archbishopic of the serbian church in the year of 1219. 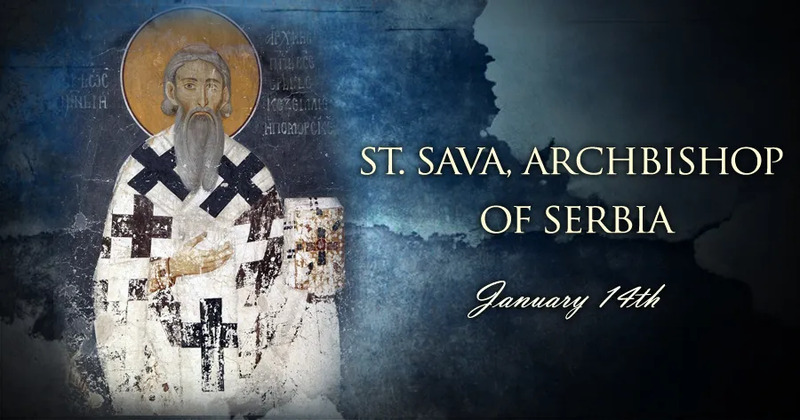 Saint Sava is celebrated as the founder of the independent Serbian Orthodox Church and as the patron saint of education and medicine among Serbs. Since the 1830s, Saint Sava has become the patron Saint of Serbian schools and students. After participating in a ceremony called "blessing of the waters" he developed a cough that progressed into pneumonia. He died from pneumonia in the evening between Saturday and Sunday, January 14, 1235. He was buried at the Cathedral of the Holy Forty Martyrs in Trnovo. He remained in Trnovo until May 6, 1237, when his sacred bones were moved to the monastery Mileseva in southern Serbia. Three-hundred and sixy years later the Ottoman Turks dug out his bones and burnt them on the main square in Belgrade. The temple of Saint Sava in Belgrade, whose construction was planned in 1939 and began in 1985 is built on the place where his holy bones were burned.